haven't posted on here much but I'm in the process of putting a 300 Norma together and plan on shooting 225 Elds. I'm looking for some loads and velocities. My barrel is 27" and I want to use a temp stable powder, Retumbo or H1000. This will be my long range elk rifle so 230 Smks are out..
Im pushing 225 eldms at 2950 with 82 grains h1000, that's the validated speed, not sure on chrono speed.. super accurate and seems to kill critters just fine. And could you please let me know what brass, and your OAL? Yeah, i started getting pressure signs after that. They like be seated deep, I'd be pretty happy with anything near 2900..
My 300 NM barrel is a 27” hawk hill throated for 230 bergers. With 230 Berger targets- 82.2-82.5 h1000 (depending on lot) gets 2930 ish FPS and any higher is tough on Norma brass. Can get a little more out of retumbo but velocities are more erratic. Can get over 3k FPS with RL33 but it is more temp sensitive and I believe harder on barrels. I’d recommend Petersen brass, seems tougher than Norma. There is a common issue with Norma mag brass expanding at the web, not getting resized by commercial dies, and resulting sticky extraction. I’d discuss the dimensions of the chamber, brass, and sizing die in this area with your gunsmith. I haven’t shot the Petersen brass enough but so far it is showing less expansion here than Norma brass. Thanks I bough a box or Berger ammo just for the lapua brass so I'm hoping it'll get me to at least 3000. I'm having it throated for 225's at the neck shoulder junction. H1000 is still my plan but I'm kicking Rl26 around too, anyone tried it in the Norma? Can get enough RL33 behind a 230 to max pressure without getting overly compressed so I haven't been tempted by RL26. I’m curious about N570, which you can’t find, or N565 which sometimes is available, or IMR 8133. I’ve got a Norma improved being built right now . I've been running bartram brass with no issues. It’s sold out now, but I was able to get 2 pounds of VV N565 and I also got a pound of 8133. I’ve got some 225 ELD-M’s and the gold standard 215 Hybrids to try. Hoping to get started on break in and fire forming in the next few weeks! Dude... please keep me updated this is the exact combo I'm looking to run! Ryan finished my rifle yesterday and shot it today. With standard Norma (non-improved) ABM ammo, shots 2,3, and 4 shot a .3” group. I can’t wait to shoot it! 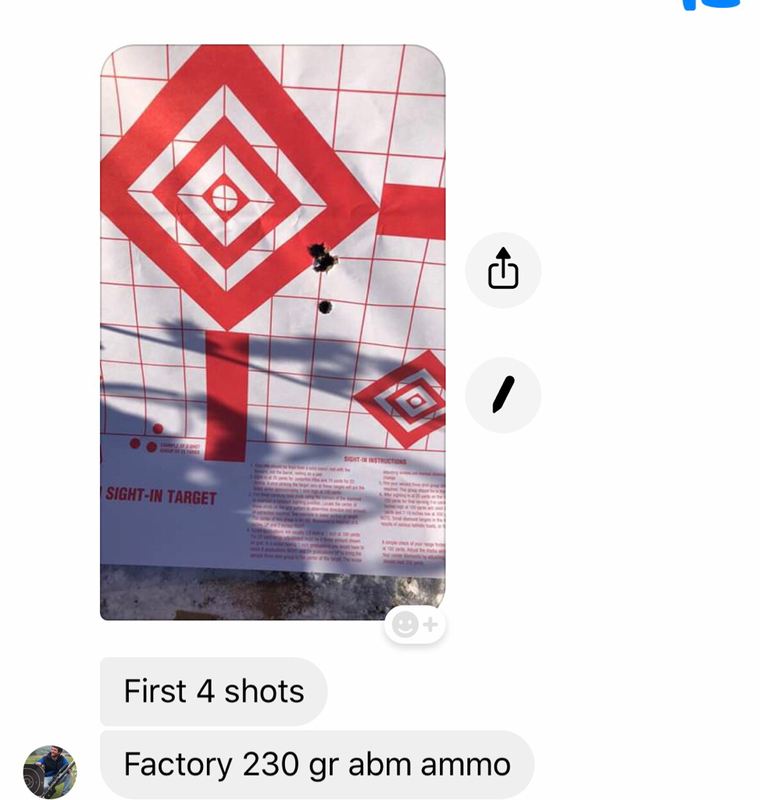 I have a couple boxes of that ABM 230 ammo I no longer need if you happen to want some more . I thought that Lapua was making (or about to make) 300 Norma brass. I'm getting around 2880 out of my 22" proof research barrel with hornady 220 eld-x. I'm using Norma brass, 84.2 g of H1000 powder. I could get more speed, but I don't like to run things too hot.